Thirty-seven years ago, a small group of students gathered at the Quarry Amphitheater for the first Multicultural Festival. Throughout the years, the event has grown to include more cultures and local artists. Now, UC Santa Cruz students are preparing to share their culture through food and musical performances to an anticipated crowd of over 2,000. 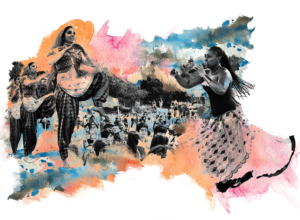 Celebrating culture through the theme, “Our Gift of Culture,” the 38th annual Multicultural Festival (MCF) is returning to Oakes Lower Lawn on May 20. The festival will host performances, live music and food from various campus organizations and groups — all to highlight the cultures present on campus. The theme embodies the idea that culture is something to be celebrated and shared with the primarily white campus. This year, about 16 organizations, including the Filipino Student Association (FSA), K-pop dance cover group POPreKa and Movimiento Estudiantil Chicanx de Aztlán (MEChA), will participate in the festival through fundraising, dance and musical performances. Mike Beneschan, co-head of POPreKa, said the importance of the festival is in learning about different cultures through experiencing them, rather than reading about them. “Events like MCF help people visualize firsthand the diversity and culture in our world that makes it such an exciting place to live,” Beneschan said. About 25 UCSC community members from the different organizations have been working on the festival since January, dedicating time and effort to making the festival bigger and better than before. “We want to show that students of color and underrepresented groups are here on this campus and we have a space within our organizations,” Evelyn Hernandez said. SOMeCA will sponsor the free event. Attendees can enter to win prizes and buy food to support the participating organizations. The first half of the day will showcase performances by student organizations like POPreKa, a cappella group Taza Tal and FSA’s Kasama Ballroom Dance Troupe. AstraLogik, a duo from the Bay Area and one of the headliners, will follow the student performances. AstraLogik will play its original, electronic, neo-soul music from its new album, “Dream Awake,” at the festival. The band will bring a special guest who plays traditional Southeast Asian percussion instruments like the kulintang with a more modern beat. Its main message with its music is to appreciate the past and use that knowledge to create a better future. Headliner La Chamba Chicha will play its psychedelic set to finish off the night. Performers like AstraLogik and La Chamba Chicha were contacted by members of the student organizations. The student involvement is a large part of why the festival has been a fixture on the campus for so long. “The students really take where they want to go every year with the performances based on what they are currently going through as communities of color, at the university or [in] the nation,” said SOMeCA associate director Katherine Canales-Molina. As student organizers continue working up to the last day to finalize the details of the event, the goal is to further the celebration of culture beyond the Saturday of the event.